Luau Loot has a theme that I haven’t seen covered too often before, with the Hawaiian style graphics used inside being very inviting and perfect if you’re dreaming about your own tropical holiday. 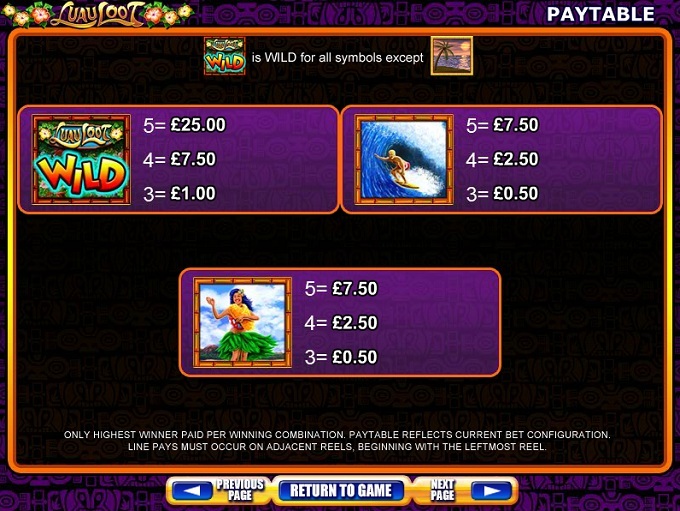 You have the usual perfect beaches with palm trees on them, you have Luau girls that are dancing, coconuts and Tiki statues, to mention just a few of the images that WMS, the slot’s developer, included inside. 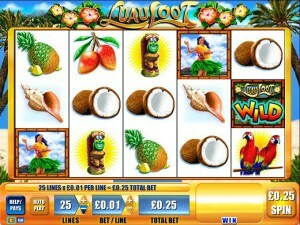 A beautiful tropical game, it hosts on its 5 reels a total of 25 win lines. 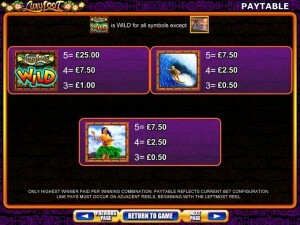 The game’s symbols also have wilds and scatters among them, plus some free spins which get wild reels. You can even win a decent prize, worth $7,500 in this case. 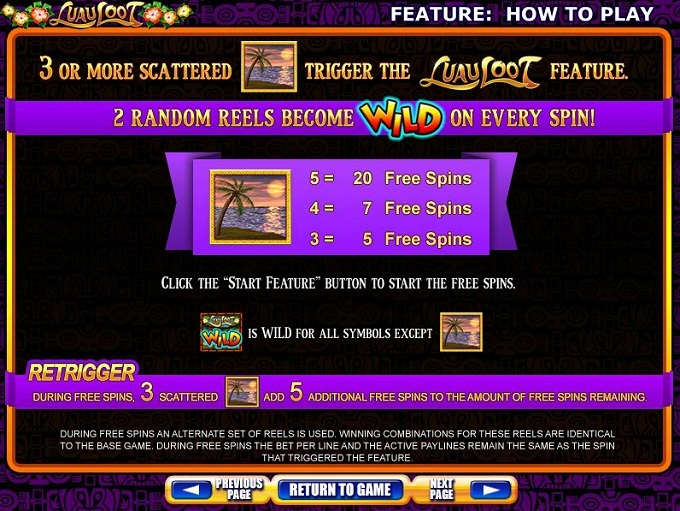 Luau Loot comes with scatter symbols, free spins with random wild reels and regular wilds that are used in the base game. The regular wild has the Luau Loot WILD logo showing on it. 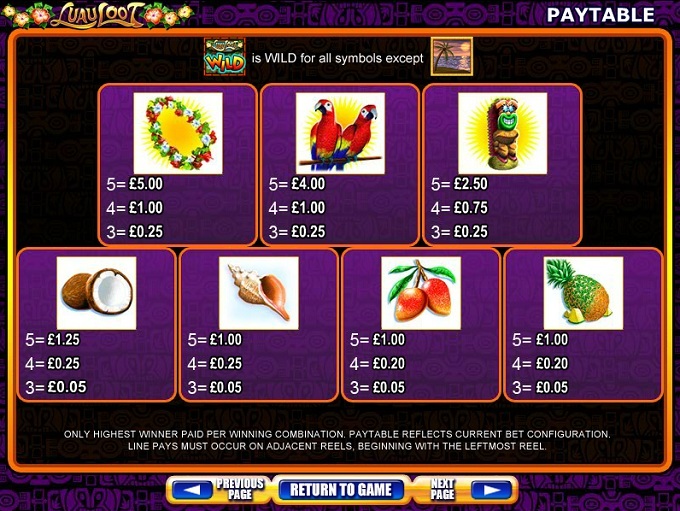 It has two roles in this game, one of them being that of a trigger for the slot’s best prize, which can go as high as 2,500 coins if you’re lucky and you arrange enough symbols of this type on a payline. Three to five symbols with WILD Logos on them need to be together and from left to right. If used as a regular wild, all you need from the wild is for the needed symbols to appear where they’re needed, so that they can substitute for regular symbols. The other major symbol would be the scatter, the same as in every other WMS slot. Have a minimum of three symbols scattered around, in any random location but at the same time, and you will receive 5 to 20 free spins. The free games come with two random wild reels. They are chosen at random each round, so they will move positions, sometimes being a lot more useful than on other occasions. 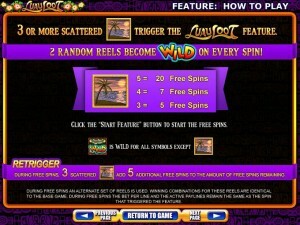 Ideally, you will land both wild reels among the first three reels, so that you’re guaranteed wins on all the paylines. If you retrigger the free spins, with 3+ symbols, you will be given 5 extra free spins on top of the remaining ones. The actual value of a 25 coins wager goes from $0.25 to $75, the line bet being between $0.01 and $3 in this case. You can modify the number of lines as well if you want to. The game offers a top reward of 2,500 coins, and that means $7,500 cash if you used a bet with $3 coins. The game’s design is very inviting, but a tropical theme will often have that effect. You see a beautiful beach in the background, with palm trees on both sides and with the ocean visible in the distance. The white reels are encased in a golden border and on them there are various tropical fruits, Hawaiian girls that are dancing, shells, colorful parrots and all sorts of other images that will make you dream about being there for real. 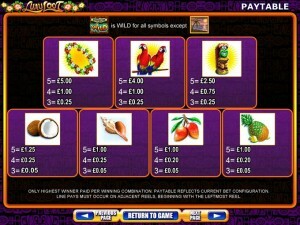 Symbols: Game Logo Wild (2,500 coins, wild), Tropical Sunset (scatter), Surfer (750 coins), Hoola Girl (750 coins), Flowers (500 coins), Two Parrots (400 coins), Tiki Statue (250 coins), Coconut (125 coins), Shell (100 coins), Red Fruits (100 coins) and Pineapple (100 coins). It’s a very inviting game, the design doing a lot to convince players to give it a shot, more than what the features do anyway. It also has good prizes to offer, so all things considered it’s a good slot to try out. 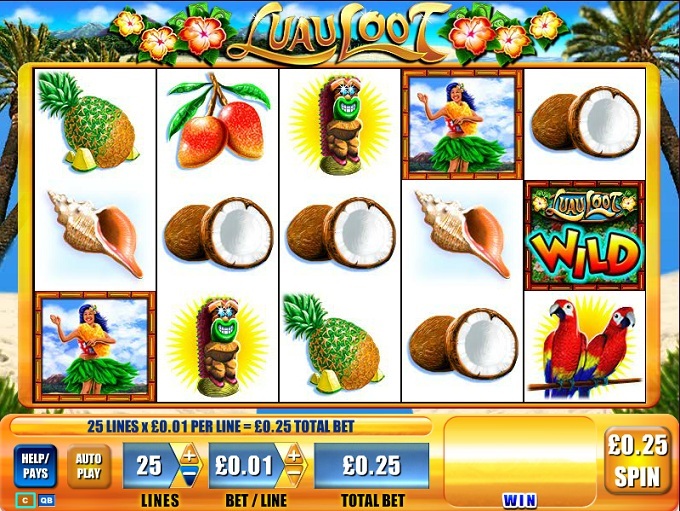 This Luau Loot slot is offered by all online casinos with WMS software, playable either in practice or in real money mode.